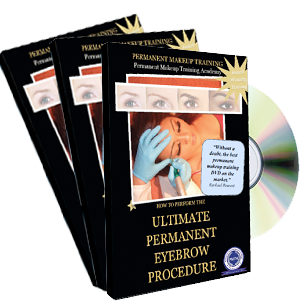 All our permanent makeup training courses and workshops are completed 1 on 1 by Katy Jobbins, Industry Author, Award Winning Permanent Make up Artist and Producer of many instructional DVDs. 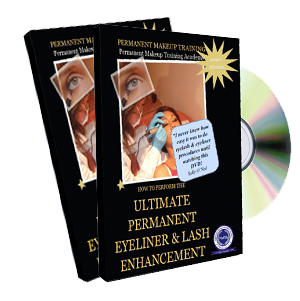 (founder of Permanent Makeup Training Academy) No questions go unanswered and you have Katy’s undivided attention for the full duration of the training. We train you in a real clinic environment. You will have the option to be trained at Katy’s head clinic/training centre in West Sussex or her Harley Street Training Centre. You will be trained in a real everyday Permanent make up clinic environment, giving you genuine working experience in the permanent makeup industry. Alternatively you can be trained in your own clinic/salon. Who better to train you in permanent makeup than an actual artist. Katy studied fine art at john Leggot college, in Lincolnshire. 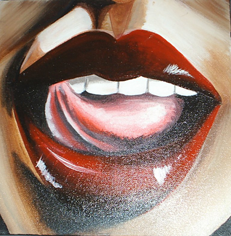 She has exhibited in galleries both locally & internationally. Her highest selling painting sold for £11,000. 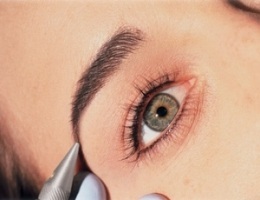 She will be able to pass on, some highly advanced permanent makeup drawing & colouring techniques to you. 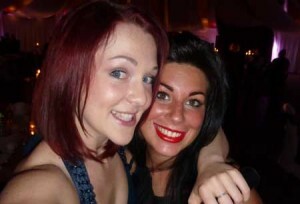 Katy runs a very successful permanent makeup business herself. Her clients travel the length of the country to use her services. View more videos on the treatments page to see some recent client video testimonials for eyebrow treatments, Eyeliner treatments and Permanent Lip enhancements. Do you want your clients to be saying the same about you? 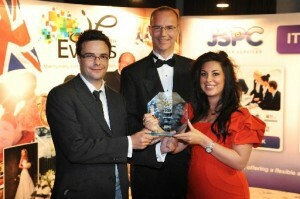 Katy employs a team of beauty experts, trainers, Doctors, marketing & PR specialists. 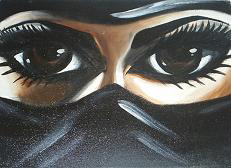 Katy herself specialises purely in permanent makeup, & permanent makeup training. 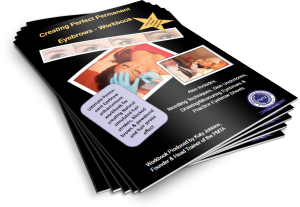 The Permanent Makeup Training Academy believe it is important to not dabble in and out of permanent cosmetics as it is very specialist, many training companies trainers often also offer nails, eyelash extensions etc. Katy the head trainer of ‘The Permanent Makeup Training Academy’ is especially known for her ‘natural simulated hair stroke technique’. She was hired to train some of the top para-medical cancer care tattooists in the art of creating the most natural looking eyebrows for their cancer patients. On Friday 18th July 2014, Katy was crowned the “Woman of the Year” for two separate awards. Katy was shortlisted as Judges finalist in 5 separate categories. 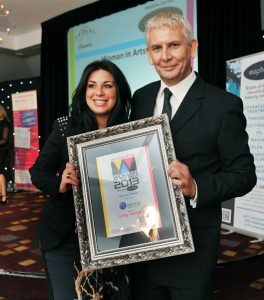 Those were Success Story, Woman in Business, Mum of the Year, Hair n Beauty & Woman in Education. 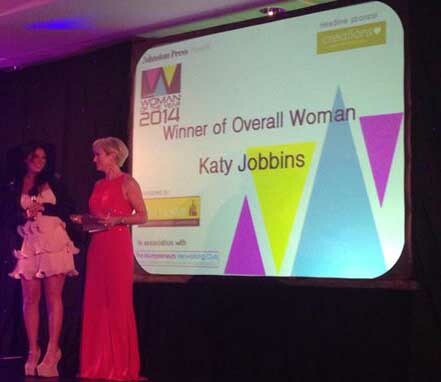 Katy won the Woman of the year for Success Story which was a fabulous achievement however the Judges then selected Katy as overall Woman of the Year Woman chosen from all winners across the 15 categories, which was quite some achievement given the calibre of the other ladies in the room. The judges commented that they were so impressed with Katy’s nominations that she could have won any of the categories she was shortlisted for, which is why they crowned her the Woman of the Year Overall Winner. 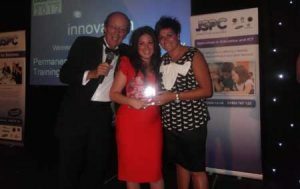 In July 2012 The Permanent Makeup Training Academy was awarded with the prestigious ‘Innovation in Business’ award at the 2012 Business Matters Awards for taking the industry by storm with new advanced techniques and training practices. Katy has recently been awarded the ‘Crème de la Crème’ award for ‘Outstanding Achievement ‘ in her field, previously won by the Billionaire, Sir Richard Branson. 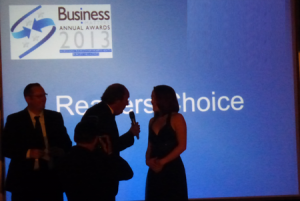 This followed her award for ‘Best Customer Focus’ at the Best Business Awards in 2009. 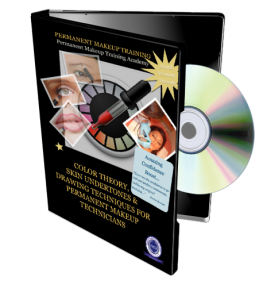 She is an author of over 10 permanent makeup related books (including her bestseller “Top Secrets & Tips to Becoming an Expert Permanent Makeup Technician.”), training manuals & reports. Katy has pioneered an exclusive new natural hair-stroke marbling permanent eyebrow technique for blondes, brunettes & women with silver hair. Click on the reports below to view her exclusive treatments. By training with us you will learn these 3 world exclusive treatments, commanding up to £700 per hour. She is qualified to the highest level of permanent makeup,making her in the top 2% in the UK. She has had extensive training in the UK, Thailand, Malyasia, Singapore & the United States of America. She has also trained alongside Harley Street technicians, Plastic Surgeons, Harrods, Selfridges & Harvey Nichols permanent makeup technicians. Katys online video tutorials have helped train over 100,000 permanent make up technicians to date in the art of permanent make up. 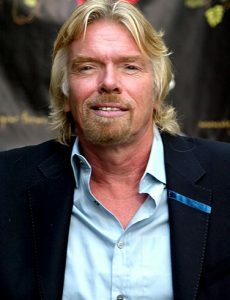 Because we have spent years and years working in the industry & and personally attended hundreds of business training seminars with the likes of Sir Richard Branson, Sir Alan Sugar, Dragon’s Den Peter Jones & Doug Richards, as well as with the billionaire, Donald Trump, learning how to develop winning business strategies of which we have successfully applied to the permanent makeup industry and that we can pass on to you. Unlike any other permanent makeup training company, the Permanent Makeup Training Academy also run exclusive 3 Day Permanent Makeup Marketing Masterclasses for both our qualified technicians & those who have originally trained elsewhere. Our award winning marketing experts teach you how to create your business plan, setting up clinics, becoming the go-to-expert in your local area & how to command the top prices in the industry for the best treatments. 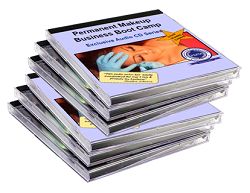 The Permanent Makeup Training Academy has produced a large selection of training DVD’s, manuals & workbooks, exclusive to us, that can be used to help aid your continuing progress as a permanent makeup technician. 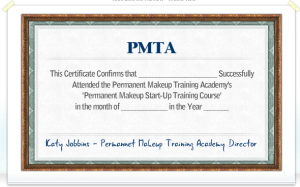 Upon Completion of your course you get your full permanent makeup training certificate & we even pay for your first years permanent makeup insurance, which covers both Treatment Risk Insurance and Public Liability Insurance. Sack Your Boss… I did Within A Month!!! Not sure if you could make it as a permanent makeup technician? If you have any doubts, then please watch this 3 minute video below. This is a video that one of our recent students made showing her clients reaction to her new permanent eyebrows. Unbelievably, this video was made less than 3 month after Amy trained with us at The Permanent Makeup Training Academy!!! Still not convinced that we are the one for you?